If you've never had the pleasure of waking up from a peaceful slumber to the eerie sound of howls, yips, and barks of wolves or coyotes, you may not understand why I was tromping through the snow one recent very cold Adirondack morning. But if you've heard it, you'll understand the reason for this wannabe's recent tracking expedition. A routinely recommended soporific, fresh air in the bedroom might be considered a luxury by some. Sleeping with the window open a crack, however, is my refreshing benefit of wood heat and a superbly insulated new home. The open window also made it easy to hear the local coyote meeting held recently, which sounded like it was held just below the open window. The cantankerous cacophony of that canine crew sounded like a ravenous wolf pack of 2 dozen creatures with the requisite rock-solid, strong bodies and sharp teeth. From the sounds of things, I presumed the big guy in today's top photo was in attendance along with a pack of his even bigger friends. If you click on this link of coyote vocalizations, choose the second sound track and turn up your speakers, you can hear how creepy it sounds. Imagine listening to those scary screams immediately outside your window late at night; it is enough to push one out of bed and indeed, out of a usual, non-naturalist role. In my case, strange but true, it worked perfectly. Even creepier, when I stood up and whispered to the resident biologist, "Did you hear that?" the coyotes abruptly fell silent. 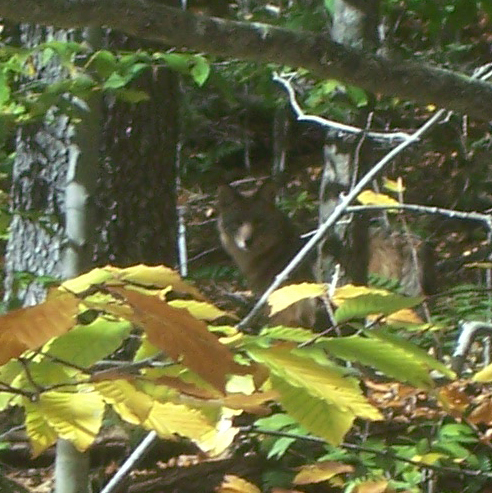 I realized they were fully aware of our presence and listening to me! Since we are ready for a new puppy, I imagined a darling black lab puppy hanging out of a she-wolf's mouth as she loped off through my yard and into the woods. I simply had to see where this pack of man-eating creatures had been and where they were heading. A wolf tracking expedition was in order. As regular readers of this blog know, I am not the biologist of the family. We have a resident one of those, and he reminded me I was not looking for wolves. "There were probably a few coyotes out there," was Ed's calm opinion. He thought I'd get tired of looking before I could find nary a track. I, on the other hand, thought, "How hard can it be, there is snow on the ground and they were right outside in the yard under the window anyway. I'll find the mass of paw prints and the bloody remains of whatever poor creature the pack took down last night in the flick of a wolf tail." I didn't even put on socks inside my snow boots as I headed out the door, so sure this would be a quick and easy expedition. Forty-five minutes of tromping through the snowy woods and with frozen feet later, I crossed a track at least 400 yards from our house. Upon first glance, it appeared just one large dog had loped by. I then noticed lighter tracks that had barely left their imprint in the snow. There was no sign of struggle; not one suggestion of the blood-crazed feeding frenzy I expected to discover. 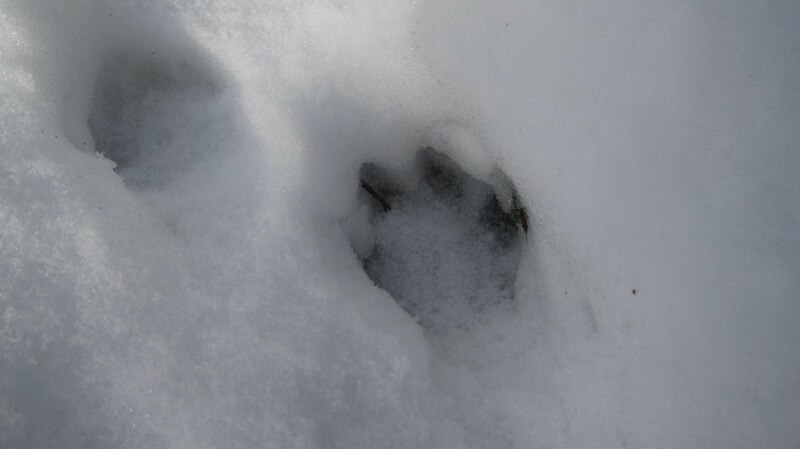 No evidence of the bones and hide I anticipated amidst the beaten down and bloody paw-printed snow. I couldn't even find beaten down, paw-printed snow. Disappointment set in; there was not even one drop of blood to be "Aha-ed!" over. Naturally, the resident biologist was not at all surprised by my foiled wolf pack tracking experience. He reminded me the wild canines who live in the Adirondacks are not wolves, rather they are Eastern Coyotes, or Canis latrans. I was happy to remind him that recent research has determined Adirondack coyotes do indeed harbor some wolf DNA, which begs my question, couldn't they really be wolves? He prefers to say they are coyotes with a little bit of wolf DNA in the mix. Ed explained current Adirondack coyotes migrated from the western United States where they were rather small creatures, 30 pounds at maximum weight, who subsisted on rodents and other small animals. As they moved east over the course of the last century, they hybridized with eastern wolves in Canada, gaining size and switching to larger prey such as deer. He also said they don't hang out in "packs," rather they cavort in "family units." A family unit consists of one or two adults with the current year's pups and a yearling or two. Hardly the pack of 2 dozen blood-thirsty wolves I had imagined. Still obsessed with the prospect of wolves in the Adirondacks, I badgered Ed, wondering why I couldn't just say my serenading canine friends are indeed wolves. "You can't say that now," he replied. I took this to mean I might someday be able to state wolves live in the Adirondacks, that is, if I live long enough. When pressed, Ed agreed. "Things are always changing, that's why they call it evolution." Biologists are masters at hedging their bets.